Last week, President Obama’s Thin Mint declaration had Girl Scout cookie fans in an uproar. But whether you love Tagalongs or Do-Si-Dos, in the thick of summer our beloved treats are nowhere to be found. Problem is, Girl Scout troops haven’t been selling their signature cookies since February, so for many of us, surviving the next six months without them will be our top concern. Here, then, is a brief history of these iconic American cookies, and for you die-hard cookie monsters who can’t wait until winter, we’ve included a recipe so you can make your own. In 1917, just five years after the Girl Scouts were founded, the first documented cookie sale was held by a troop in Muskogee, Oklahoma. These girls sold baked goods made in their own home kitchens, and used their funds to purchase handkerchiefs for soldiers serving in World War I. The practice soon expanded to troops in other states and became an integral part of the organization, with celebrities like First Lady Grace Coolidge and Babe Ruth helping to promote the annual cookie sales. Among the first published Girl Scout cookie recipes was the “Butter Trefoil” cookie, a simple shortbread sugar cookie in the shape of the official Girl Scout emblem. Originally printed in 1922, the recipe accompanied an interview with the organization’s Chicago regional director, who estimated the cost of ingredients between 26 and 36 cents per batch. Over the years, in addition to a variety of recipes, the national Girl Scouts organization produced scores of cookie cutters, posters advertising the sales, and standardized cookie packaging. 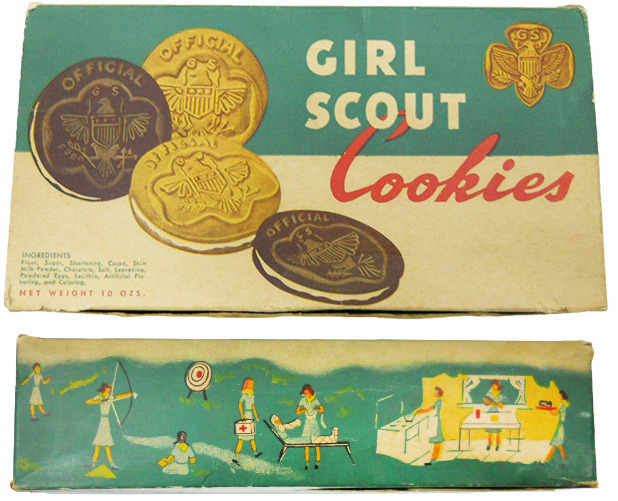 Top: A cookie box from 1949 decorated with images of typical Girl Scout activities, from archery to cooking. Courtesy Ellen DeMaio. Above: A cookie sale poster from the 1950s. Girl Scout collector Carol Altvater explains that initially, “when they started selling cookies en masse, different councils would actually contract with local bakeries to make official Girl Scout cookies. A group could just go to any bakery in their city and ask, ‘Would you make Girl Scout cookies for us?’ There were a bunch of Girl Scout cookbooks at that time, and all of them had cookie recipes.” In 1936, the national Girl Scouts organization embraced the fundraisers and licensed the first commercial bakery to produce treats for sales nationwide. 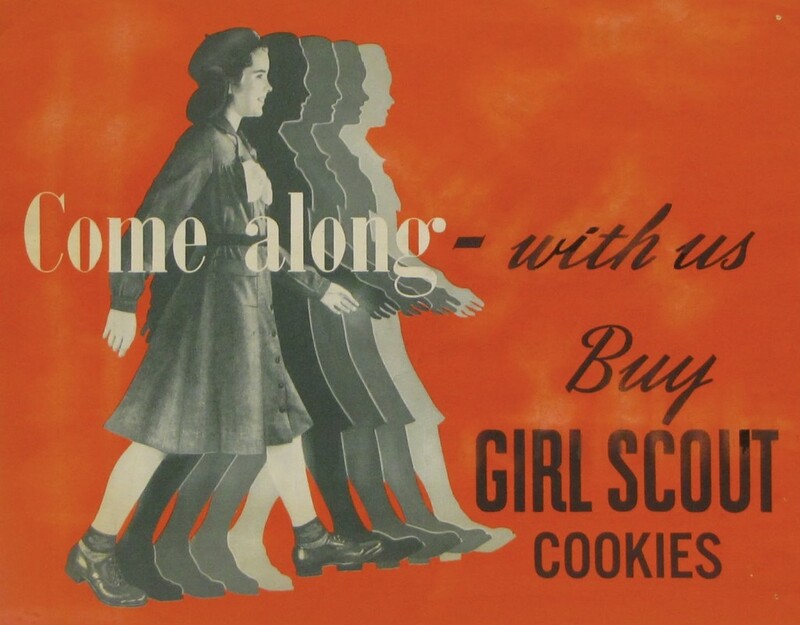 Although ingredient rationing during World War II forced the councils to sell calendars rather than baked goods, by 1948 there were 29 licensed bakeries churning out official Girl Scout cookies. Thin Mints, the current top-sellers and the President’s favorites, were introduced in the 1950s, while another fan favorite known as Samoas or Caramel deLites, depending on the region, were created in the 1970s. While cookie sales are generally the most visible side of the Girl Scouts, they’re just one method of raising money for a host of other activities. After paying the bakers for their product, every dollar made stays with a troop’s local Girl Scout Council, with a smaller percentage returning to the specific troop who earned it. These edible fundraisers provide money for everything from troop uniforms to outdoor activities, as a slogan from the 1960s nicely sums it up: “Cookie money is camping money.” Today, around 200 million boxes of the cookies are sold each year, bringing in close to $760 million in revenue. In addition to providing necessary funds to further the organization’s many goals, cookie sales directly teach scouts a variety of entrepreneurial skills, including money management, business ethics, and goal-setting. An official Girl Scout cookie-cutter box from 1932 seen alongside a trefoil-shaped cutter from 1949. Courtesy Ellen DeMaio. Starting in a small Scottish town she visited during the summer of 1911, Low began inviting neighbor girls into her home to learn skills like knot-tying, map-reading, and flag-signaling. Primarily the children of impoverished rural families, these young women were eventually expected to leave the countryside in order to do mind-numbing work in factories. Low hoped that learning hands-on domestic skills would increase their chances of sustaining themselves in their own hometowns. Flanked by two early troop leaders, First Lady Grace Coolidge takes a dainty bite from a Girl Scout cookie in 1923. After returning to her home in Savannah, Georgia, Low formally established the American version of the Girl Guides in March of 1912. She had already begun work on a new version of the Girl Guide handbook, creating her own updated guidelines and incorporating segments by local naturalist W.J. Hoxie. The organization’s name was switched to Girl Scouts the following year, and women across the country were soon contacting Low to start their own troops. These earliest members designed, cut, and sewed their own uniforms, as well as the first trefoil badges. This original three-leaved emblem signified a “Tenderfoot,” or girl who was new to the scouting world. Two images from 1955 show the Girl Scouts in action, selling cookies door to door and in small businesses. In the Girl Scouts’ first promotional film from 1918, called “The Golden Eaglet,” a young girl uses her “scout’s pace,” when seeking help in an emergency, alternating ten steps walking with ten steps running. In many ways, the Girl Scouts have maintained this quickened pace from their founding clear to the present. Public attention recently returned to the Boy Scouts of America’s policy of excluding LGBTQ members or leaders from the organization despite protests from within and without. Conversely, last fall the Girl Scouts of Colorado published a statement through GLAAD announcing that “if a child identifies as a girl and the child’s family presents her as a girl, Girl Scouts of Colorado welcomes her as a Girl Scout.” By inviting transgender children into its ranks, the Girl Scouts signaled a continued commitment to growth and inclusion. Left, a home placard from the late 1930s indicates its owners have already placed their orders (so please don’t knock). Right, a 1943 cookie advertisement on a Cincinnati bus pass. Courtesy Carol & Ernie Altvater. Ernie Altvater points out that although the group’s older slogans or policies may seem objectionable today, they accurately reflected the organization’s priorities at the time. He explains that “In the late 1930s, their advertising slogan on billboards and publicity material read, ‘Girl Scouts: Half a million future homemakers.’” To modern ears this might sound like a bad joke, but in the 1930s being a capable homemaker was what many girls desired, and the Girl Scouts taught them skills to do it well. As trite as it may seem, this was not necessarily an easy task, particularly in a day before washing machines, baby monitors, and mass-produced cookies. 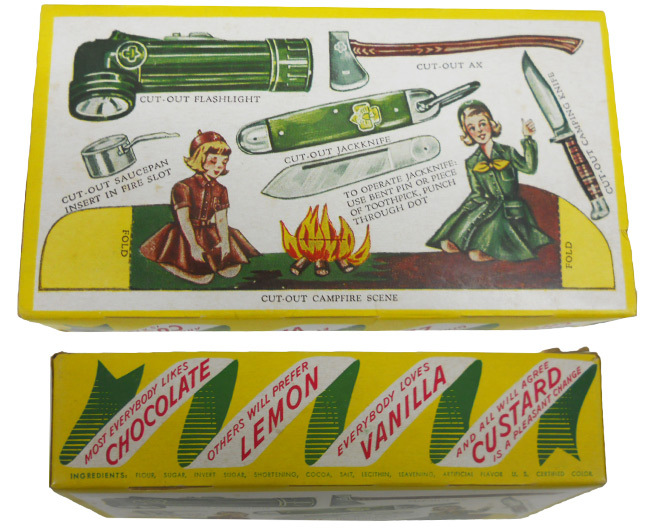 The back of this 1951 cookie box features a cut-out campfire scene along with images of the tools scouts could earn. Many leaders used this cardboard knife for their safety trainings. Courtesy Ellen DeMaio. So how can you get your hands on those yummy treats during summer vacation? Easy: Try making them yourself, using the oldest known recipe for simple shortbread trefoils. You might not get the warm fuzzy feeling that comes from knowing your purchase put a pocket knife in the hands of a skirted scout, but right now, it’s all about the cookies. Thin mints…I’ll empty a box quick. Many successful women learned their first leadership skills in the Girl Scouts. Wish I’d kept my Brownie outfit! For nearly 20 years I worked in two different offices where a manager would prominently post a sign-up sheet for his or her daughter’s GS cookie sales. Never saw or heard from the actual Girl Scout, before or after the sales. What do you suppose those scouts learned from this? It teaches the most important of all entrepreneurial skills, Networking. Obviously it teaches the power of networking and how to use one’s personal network to accomplish objectives and reach goals. Priceless! I am looking for the Peanut Butter Cookie recipe that was in the GS cookbook Late 1940’s or early 1950’s.